This unit focused on proteins: dairy, eggs, and meat. Our first lab was to let milk sit for 1/2 hour with lemon juice in it. I actually ran this twice because I do this very thing often and the first time for whatever reason did not turn out chunky at all. The second time it turned out beautifully. I didn't do anything different (to my knowledge) either of these times, so I'm still perplexed as to the different result. The second lab was in two parts. 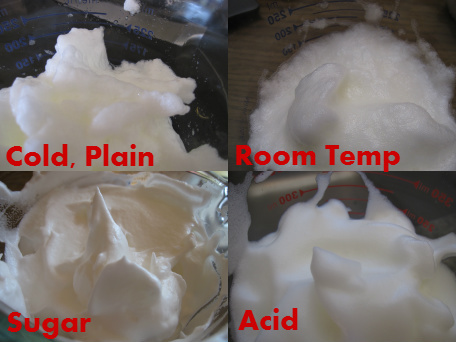 Assessing the freshness of eggs and making egg foams. For part one we had to put an egg in water and assess if it was floating or not. The older the egg, the larger the air sac at the broad end, the more likely it is to stand up straight in the water rather than lay down. 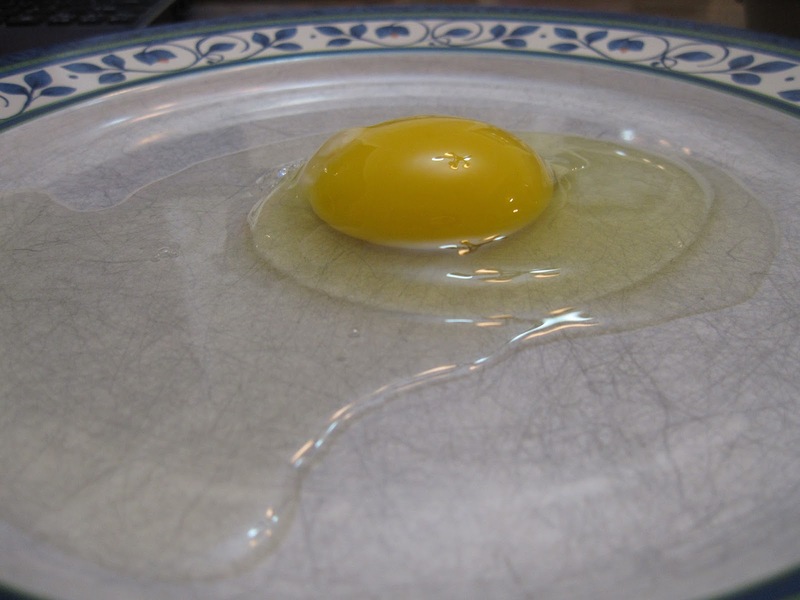 Then I cracked the egg and put it on a plate to evaluate the yolk and white. Mine was quite fresh, with a nicely rounded yolk, a sturdy thick egg white and a runny thin egg white. Then we beat egg whites in several variations, timing how long it took to achieve firm peak stage. 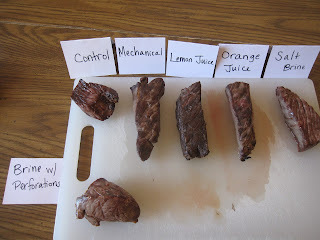 The third lab was dealing with meat tenderness. We used top round steak, cut it into 6 approximately equal segments, prepared them in different ways, and broiled them. 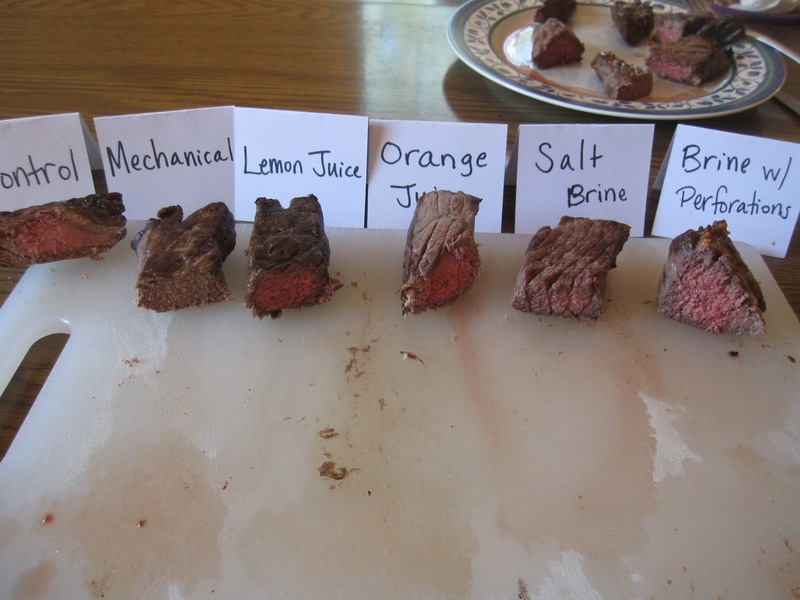 I found the salt-brine with perforations in the meat to be the best of the variations. Taste-testing the meat was my lunch that day. Mal had a hard time waiting until I got all my observations recorded to taste the meat. He grabbed a chunk as soon as I let him and ate it all. Surprising, as he isn't often a big meat-eater (always refuses turkey or ham at holidays), though we also never have beef outside of ground beef. And the chunk he grabbed was just the control - not the most tender of the preparations, though it had a decent beefy flavor. So apparently he likes beef. Ryan got to have the leftovers for his dinner that night.